For other uses, see Rabbit-proof fence (disambiguation). Rabbit-Proof Fence is a 2002 Australian drama film directed by Phillip Noyce based on the book Follow the Rabbit-Proof Fence by Doris Pilkington Garimara. It is loosely based on a true story concerning the author's mother Molly, as well as two other mixed-race Aboriginal girls, Daisy Kadibil and Gracie, who ran away from the Moore River Native Settlement, north of Perth, Western Australia, to return to their Aboriginal families, after being placed there in 1931. The film follows the Aboriginal girls as they walk for nine weeks along 1,500 miles (2,400 km) of the Australian rabbit-proof fence to return to their community at Jigalong, while being pursued by white law enforcement authorities and an Aboriginal tracker. The soundtrack to the film, called Long Walk Home: Music from the Rabbit-Proof Fence, is by Peter Gabriel. British producer Jeremy Thomas, who has a long connection with Australia, was executive producer of the film, selling it internationally through his sales arm, HanWay Films. In 2005 the British Film Institute included it in the BFI list of the 50 films you should see by the age of 14. Set in 1931, two sisters – 14-year-old Molly and 8-year-old Daisy – and their 10-year-old cousin Gracie live in the Western Australian town of Jigalong. The town lies along the northern part of one of the fences making up Australia's rabbit-proof fence (called Number One Fence), which runs for over one thousand miles. Over a thousand miles away, the official Protector of Western Australian Aborigines, A. O. Neville (called Mr. Devil by them), signs an order to relocate the three girls to the Moore River Native Settlement internment camp. The children are referred to by Neville as "half-castes", because they have one white and one Aboriginal parent. Neville's reasoning is portrayed as: the Aboriginal people of Australia are a danger to themselves, and the "half-castes" must be bred out of existence. He plans to place the girls in a camp where they, along with all half-castes of that age range, both boys and girls, will grow up. They will then presumably become labourers and servants to white families, regarded as a "good" situation for them in life. Eventually if they marry, it will be to white people and thus the Aboriginal "blood" will diminish. As such, the three girls are forcibly taken from their families at Jigalong by a local constable, Riggs, and sent to the camp at the Moore River Native Settlement, in the south west, about 90 km (55 miles) north of Perth. Map of the rabbit-proof fence showing the trip from Moore River to Jigalong. During their time at the camp, Molly notices a rain cloud in the sky and infers that if she, Gracie and Daisy were to escape and go back to Jigalong on foot, the rain will cover their tracks, making them difficult to follow. Gracie and Daisy decide to go along with Molly and the three girls sneak off without being noticed and run away. On the same day, however, their absence is noted, and Aboriginal tracker, Moodoo, is called in to find them. However, the girls are well trained in disguising their tracks. They evade Moodoo several times, receiving aid from strangers in the harsh Australian country they travel. They eventually find the rabbit-proof fence, knowing they can follow it north to Jigalong. Neville soon figures out their strategy and sends Moodoo and Riggs after them. Although he is an experienced tracker, Moodoo is unable to find them. The film's epilogue shows recent footage of Molly and Daisy. Molly explains that Gracie has died and she never returned to Jigalong. Molly also tells us of her own two daughters; she and they were taken from Jigalong back to Moore river. She managed to escape with one daughter, Annabelle, and once again, she walked the length of the fence back home. However, when Annabelle was 3 years old, she was taken away once more, and Molly never saw her again. In closing, Molly says that she and Daisy "... are never going back to that place". The film is adapted from the book Follow the Rabbit-Proof Fence, by Doris Pilkington Garimara, which is the second book of her trilogy documenting her family's stories. The film stirred controversy in Australia relating to the government's historical policy of removing part-Aboriginal children, who became known as the Stolen Generations, from Aboriginal communities and placing them in state institutions. Eric Abetz, a government official, announced the publishing of a leaflet criticising the film's portrayal of the treatment of indigenous Australians, and demanded an apology from the filmmakers. Director Phillip Noyce suggested instead that the government apologize to the indigenous people affected by the removal policy. Conservative commentators such as Andrew Bolt also attacked the historical accuracy of the film. Bolt criticized the numerous disparities between the film and Pilkington Garimara's novel, a fact that angered Pilkington Garimara, who said that Bolt had misquoted her. The academic Robert Manne in turn accused Bolt of historical denialism, and scriptwriter Christine Olsen wrote a detailed response to Bolt's claims. Olsen attributed the angry response among some of the public to the fact that it was based in events that were "demonstrably true" and well-documented. However, the filmmakers said that the film was meant primarily as a drama rather than a political or historical statement. Noyce stated, "If drama comes from conflict, there's no greater conflict in Australian history than the conflict between indigenous Australians and white settlers." The historian Keith Windschuttle also disputed the film's depiction of events, stating in his work The Fabrication of Aboriginal History that Molly and the two other girls had been removed for their own welfare, and that the two older girls had been sexually involved with white men. Noyce and Olsen rejected these criticisms, stating that Windschuttle's research was incomplete. Pilkington Garimara denied Windschuttle's claims of sexual activity between her mother and local whites, stating that the claims were a distortion of history. The film received positive reviews from critics. Rotten Tomatoes gave it a rating of 88% based on 138 reviews, with an average rating of 7.6 out of 10. The site's consensus states, "Visually beautiful and well-acted, Rabbit-Proof Fence tells a compelling true-life story." On Metacritic the film has a score of 80 out of 100, indicating "generally favorable reviews". David Stratton of SBS awarded the film four stars out of five, commenting that Rabbit-Proof Fence is a "bold and timely film about the stolen generations." 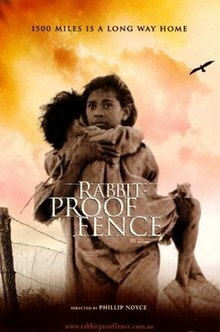 Rabbit-Proof Fence grossed US$3,756,418 in Australia, and $6,199,600 in the United States. Worldwide, it grossed $16,217,411. 2001 – Queensland Premier's Literary Awards. ^ "Rabbit-Proof Fence (PG)". British Board of Film Classification. 24 July 2002. Retrieved 2 January 2012. ^ "Rabbit-Proof Fence Title Details". National Film and Sound Archive. Retrieved 28 July 2007. ^ Brewster, Anne (2007). "The Stolen Generations: Rites of Passage: Doris Pilkington interviewed by Anne Brewster (22 January 2005)". The Journal of Commonwealth Literature. 42 (1): 143–159. doi:10.1177/0021989407075735. ^ a b c d e Fickling, David (25 October 2002). "Film: The stolen ones". The Guardian. London, UK. ^ a b Byrnes, Paul. "Rabbit-Proof Fence (2002): Curator's notes". Australian Screen Online. Canberra: National Film and Sound Archive. ^ Maddox, Garry; Munro, Kelsey (15 December 2009). "Director, historian at odds over film". The Sydney Morning Herald. Retrieved 14 February 2018. ^ Perpitch, Nicolas (15 December 2009). "Historian's Aboriginal claims a distortion, says author". The Australian. Sydney. ^ Stratton, David. "Rabbit-Proof Fence (review)". SBS. Retrieved 14 February 2013. ^ "Rabbit-Proof Fence (2002) – International Box Office Results". Box Office Mojo. 2 December 2007. Retrieved 16 May 2010. ^ "Rabbit-Proof Fence (2002)". Box Office Mojo. 2 December 2007. Retrieved 16 May 2010. ^ "Premier's Literary Awards website". 29 June 2007. Archived from the original on 28 May 2007. ^ "Queensland Premier's Literary Awards". 26 June 2007. Archived from the original on 13 August 2007. ^ "Australian Film Institute website". 29 June 2007. ^ a b "Film Critics Circle of Australia website". 29 June 2007. ^ "Lexus Inside Film Awards website". 29 June 2007. ^ "NSW Premier's History Awards 2002". NSW Ministry for the Arts. Archived from the original on 27 September 2007. Retrieved 17 July 2007. ^ "Aspen Film website". 28 June 2007. ^ "2002 Aspen Film Awards". 29 June 2007. ^ "Castellinaria International Festival of Young Cinema". 29 June 2007. ^ "Denver International Film website". 29 June 2007. ^ "Durban International Film Festival website". 29 June 2007. ^ "Edinburg International Film Festival website". 29 June 2007. ^ "Leeds International Film Festival website". 29 June 2007. ^ "The National Board of Review, USA website". 29 June 2007. ^ "San Francisco Film Critics Circle website". 29 June 2007. ^ "Valladolid International Film Festival website". 29 June 2007. ^ "The Critics Circle". 29 June 2007. ^ "São Paulo International Film Festival website". 29 June 2007. ^ "Camerimage website". 29 June 2007. ^ "Golden Trailer Awards website". 29 June 2007. ^ "Golden Globe Awards website". 29 June 2007. ^ "Motion Picture Sound Editor website". 29 June 2007. ^ "Political Film Society website". 29 June 2007. Archived from the original on 21 August 2007. ^ "Young Artists Award website". 29 June 2007. Pilkington, Doris (Nugi Garimara) (1996). Follow the Rabbit-Proof Fence. St. Lucia: University of Queensland Press. ISBN 978-0-70-222709-7.